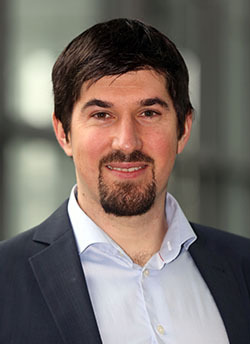 In September 2014 Sebastian Böser took up the professorship for experimental astroparticle physics at the Cluster of Excellence PRISMA, Department of Physics, Mathematics and Computer Sciences of Johannes Gutenberg University in Mainz. The new research group is targeting the future extensions of the IceCube neutrino observatory at the South Pole. The recently discovered flux of high-energy neutrinos of astrophysical origin can provide important clues to solve the long-standing puzzle of the origin of cosmic rays. At low energies, a precise measurement of the atmospheric flux can give information about the properties of the neutrinos itself – in particular the ordering of the neutrino mass eigenstates – and will thus contribute to our understanding of the physics beyond the standard model. Next to the determination of the neutrino mass hierarchy and the development of new methods to lower the energy threshold of the detector one focus of the research will be the development of new light sensors. Using a concept based on wavelength-shifting and light-guiding materials the approach promises not only higher light collection efficiency but also a significantly reduced sensor self-noise. Acting as a pathfinder, this new technology can allow further extension of the detector with a threshold in the MeV range, which would not only allow to search for CP-Violation in the neutrino sector, but also can detect neutrinos from supernova in other galaxies than our own, opening the door to a multitude of phenomena in astroparticle and particle physics. The described research here contributes to Research Area B: "Origin of Mass und Physics Beyond the Standard Model“. Sebastian Böser was born in 1977 in Starnberg, Bavaria. He studied physics at the Technical University in Munich where he acquired the diploma dregree. At DESY Zeuthen Sebastian Böser took on his doctoral studies graduating there in 2006; title of his PhD Thesis: "Acoustic detection of high-energy cascades in ice". After a postdoctoral employment at DESY Zeuthen he took on a Marie Curie Fellowship at the University College in London from 2007 to 2010. From 2010 until his appointment at JGU Mainz, Sebastian Böser was employed as research scientist (Akademischer Rat) in the astroparticle physics group at Bonn University, Germany. Titel of dissertation: "Acoustic detection of high-energy cascades in ice"
Science 342 (2013) 1242856. arXiv:1311.5238, doi:10.1126/science.1242856. Phys.Rev.Lett. 113 (2014) 101101. arXiv:1405.5303, doi:10.1103/PhysRevLett.113.101101. G. Aad, L. Asquith, S. Böser, et al. Y. Abdou, K.-H. Becker, J. Berdermann, M. Bissok, C. Bohm, et al. P. Allison, J. Auffenberg, R. Bard, J. J. Beatty, D. Z. Besson, S. Böser, et al.